I feel that German Shepherds are a wonderful breed of dogs. I have a GSD he is nearly two years old and he is by far the best dog we have ever owned. My sister also has a GSD another wonderful dog. I have a cream colored GSD so he has the traditional color markings but he is cream and black. My sister has a traditional GSD so he is black and tan, both dogs are extremely beautiful. I think the breed is the best because they are extremely intelligent dogs. They are very easy to train and eager to please. All of the German Shepherds I have come in contact with have loved children and been very gently with them. They want to learn and be around you constantly. The breed does tend to shed quite a bit more than any other breed we’ve owned. They are a very active breed always wanting to play and run. As a puppy they are much more active and needy but the older they get the more relaxed they become usually around year two is when they are fully grown. 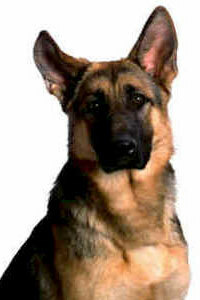 I feel that German Shepherds are a beautiful breed of dog. They are tall lean dogs that have long upright ears. They are very intelligent looking. The breed has a certain air about them that seems to say “we are intelligent and ready to protect the ones we love”. When I look for pictures of GSD I look for the dog to be standing so you can see how their posture is they should be standing upright with their hind legs slightly extended behind the hips. Also they need to have both ears up. Pictures of German shepherd puppies are a little different; the puppies are a little awkward looking like most puppies with a normal sized body and very large feet, ears, snout, and tail. Puppies’ ears should be standing up by the time they are 6 months old. When I look for pictures on the internet GSD breeders usually have better pictures of the dogs because they know how to make them stand and the dogs are usually part of a prestigious bloodline. But I love them all. Even though German Shepherds are Beautiful; but they have more than just looks; they useful and multi talented, very well known for the Blind, as a Guide Dog, Police and Military Dogs, Search and Resue Dogs etc and just all round Great Family Dog - Protector!!! My first Shepherd, Kelly, my second Shepherd,Cleo and now, Mia, she is 3 and she is my Protector and we Love her so much! German Shepherds are Amazing!! !